Greeting you with the 25th anniversary of establishment of the Constitutional Court, an institution which implements the Constitutional judicial power, I wish you every success in you further work. Please accept my warm greeting to all of you who accepted our invitation and came to take part in our conference, to all participants who have prepared their presentations to share the experiences of their countries. Constitutions have been present in the history of mankind for over 200 years and it is widely accepted that an attempt to limit the state power by law lay in the root of creation of a constitution. While the idea of limiting the absolute authority of the monarchy was the source of the constitutional tradition, it is also justified to state that the actions and intentions of the parliament to over-exercise its powers and increase its own authorities became the reason for establishment of constitutional checks. The idea of constitutional control has a history of over hundred years since its evolvement. The nature of constitutional checks is a state control of compliance with the Constitution and it is implemented within the judicial system in most countries while there are some countries with arrangement of such a control outside of the judicial system. There have been tendencies in the ruling authorities to breach the constitution in practice. Constitutional non-compliance can be intentional and accidental where the intentional non-compliance is associated with disregard of the constitution and deliberate misinterpretation of its content and meaning. From all these, the humanity came to a conclusion that there should be a constitutional judicial branch and constitutional control. The institution that exercises the constitutional judicial power is vested with the duties of strict enforcement of the constitution, its protection from governmental authorities, and assurance of the functioning of the constitutional order. From this angle, a proverb that constitution without a court is a lion without teeth spread in Europe. Constitutional courts with their origins in Austria have now been established in most of the European countries and have opened their doors in all continents including most of the countries of Asia. An example of some factual impacts of globalization in the global development is the attitude towards constitutionalism and the universal recognition and implementation of constitutional judiciary all over the world for the precious goal of dissemination of the culture of rule of law. This can be described on the example of a constitutional court as an institution of constitutional checks. The new Constitution of Mongolia was adopted in 1990 in connection with the nation’s transition into a new democratic system. The Constitution provided establishment of a constitutional jurisdiction in Mongolia titled as Constitutional Tsets symbolizing wisdom employed for defence of the primary law with an aim to safeguard the basic rights of the citizens by limiting the power and activities of the institutions practising the state authority. An achievement of the new democratic Constitution of Mongolia was the creation of the Constitutional judicial institution within the constitutional system as a mechanism for strengthening the constitutional principles. Thus a precious role of strict and rigid observance and defence of the Constitution free from side influences was allotted only to the Constitutional Court named the “Constitutional Tsets”. A dignified fulfilment of this duty by the Constitutional Court will mean implementation of its mission to maintain stability of the state and social system of Mongolia and defend her already established democratic system. The role of a constitutional court is highly valued globally as it strengthens the constitutional traditions and maintains the reference for the respect of the rule of law by officials and institutions exercising the governmental authority. The Mongolian Constitutional Court is meeting its 25th anniversary since it has followed this path. The legal power of the decisions of the Constitutional Court was guaranteed by the Constitution deriving from the necessities of cherishing the Constitution and constitutionalism, observance of law and protection of the human rights and freedoms. Generally, the decisions of the Constitutional Court is different from the decisions of other institutions in that its decisions are supposed to be obeyed universally, are valid for a long term and tend to establish precedences. Moreover, the decisions of the Constitutional Court impose deep impact on the society and define the attitude of officials and citizens towards the rule of law. Within its competencies provided by the Constitution, the Constitutional Court announces null and void the laws, resolutions, decrees and other decisions issued by the President, State Great Khural and Government if they contradict with the Constitution and establishes whether certain actions of authorized officials are in conflict with the Constitution. The objectives of examining and resolving disputes by the Constitutional Court (Tsets) of Mongolia is to guarantee strict adherence to the Constitution through resolution of disputes upon complete, accurate and objective examination of all claims concerning a breach of the Constitution. A citizen may appeal to the Constitutional Court on any issue of a dispute within the jurisdiction of the judicial institution and there is no obligation to have the issue preciously resolved by another court. The Constitutional Court of Mongolia can examine disputes over breach of the Constitution upon complaints or information given by citizens, at its own initiative or at a request of the State Great Khural, President, Prime Minister, Supreme Court or Prosecutor General. Examination and resolution of disputes are carried out by the members of the Constitutional Court appointed under legally established procedures: a minor bench session is held with 3 members, a medium bench session is held with 5 members and a full bench session proceeds with 7 members. Complaints concerning a decision of a Member of the Constitutional Court on initiating or not initiating proceedings based on petitions, notifications and requests addressed to the Constitutional Court are considered by a minor bench session; the primary conclusions of whether the decisions issued by relevant officials or institutions comply with the Constitution are carried out by a medium bench session; and, in case the State Great Khural rejects the conclusions of the medium bench session or new circumstances arise in relations with the previously resolved disputes, resolutions are issued upon consideration at a full bench session. This decision is the final and is in force from the moment of its issuance. When the Constitutional Court was established in Mongolia, the citizens of our country lacked knowledge of constitutional judicial authority. However, the situation changed eventually year by year and the understanding of the Constitutional Court strengthened in the people. This is evidenced by the annual increase in the number of petitions and disputes and the changes in the content and topics of the petitions and notifications received. The petitions and notifications arriving from citizens have been discussed by the Constitutional Court and human rights violations have been intercepted in the results. These resolutions came to be further implemented as precedences preventing repetition of similar violations and made positive impact in safeguarding human rights and freedoms and strengthening constitutional order. 15-20% on breaches of the Constitution by a high level governmental official (the President, Speaker of the Parliament, MP, Prime Minister, member of the Government, General Judge of the State Supreme Court or State Prosecutor General). Dispute examination and resolution proceedings were initiated for 10% of all the petitions and notifications with further resolutions. The remaining 90% are not constitutional issues or fall within the jurisdiction of other institutions. Since the establishment of the Constitutional Court of Mongolia, 55% of the resolutions it carried out were conclusions of constitutional breach.Also conclusions of violation of the Constitution were issued for 60% of the disputes examined and resolved in relations to provisions of the Constitution concerning human rights and freedoms. As mentioned above, the Constitutional Court of Mongolia has resolved a handful of disputes associated with human rights and freedoms. Thus, the Constitutional Court issued resolutions on the rights of the citizens to ownership and to obtain properties by honest ways; the rights to free choice of occupations, to employment, to pensions and allowances and health care; freedom of belief and consciousness; rights to elect and to be elected, to assembly, to demonstrations, to make petitions and complaints to governmental agencies and officials, to search for and receive information; rights to inviolability, freedom from limitation of rights without legal justifications and to privacy; and rights to petition to a court, to appeal a court’s decision, and to qualified legal assistance. All these resolutions had a great impact on the society in the direction of strict compliance with the Constitution. Moreover, the Constitutional Court of Mongolia protected with its decisionsequality of the citizens as it corrected many laws and resolutions which contained regulations that created disparity or discrimination. Any attempt by authorities to widen their constitutional power or to reduce the rights and freedoms of others and any action beyond the legal limits shall be detected by the Constitutional control. 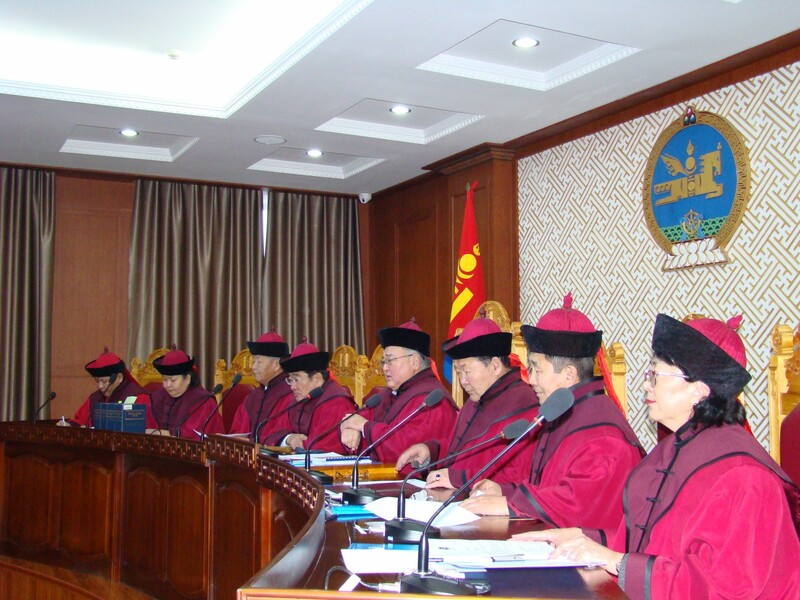 A study of the resolutions of the Constitutional Court of Mongolia will demonstrate abolition of many decisions and legal acts which have trespassed the boundaries of the checks and balances and attempted to increase the authorities of their authors. This way the Constitutional Court has been defending the core principle of democracy – the system of division of power maintaining the necessary balance in it. In many cases, the decisions of the Constitutional Court bring political stability. The decisions of the Constitutional Court are issued with reference to the Constitution and based on its principles and, moreover, there’s no higher institution of appeal and the decisions of the Constitutional Court are obeyed with respect to the Constrictionand they should only be implemented. The independence of the judicial branch provided and guaranteed by the Constitution of Mongolia has been defended and strengthened by numerous resolutions and decisions of the Constitutional Court. These decisions reveal that there are many factors that may affect the official and personal independence of arbiters and those have been investigated and resolved following the petitions and notifications of individuals as well as requests of relevant agencies. Scholars and researchers agree that the very presence of the Constitutional Court of Mongolia plays an important role in prevention of violations of the Constitution. Basically, it has been proved in practice that the primary importance of instituting a legal check system is in its preventive functions. 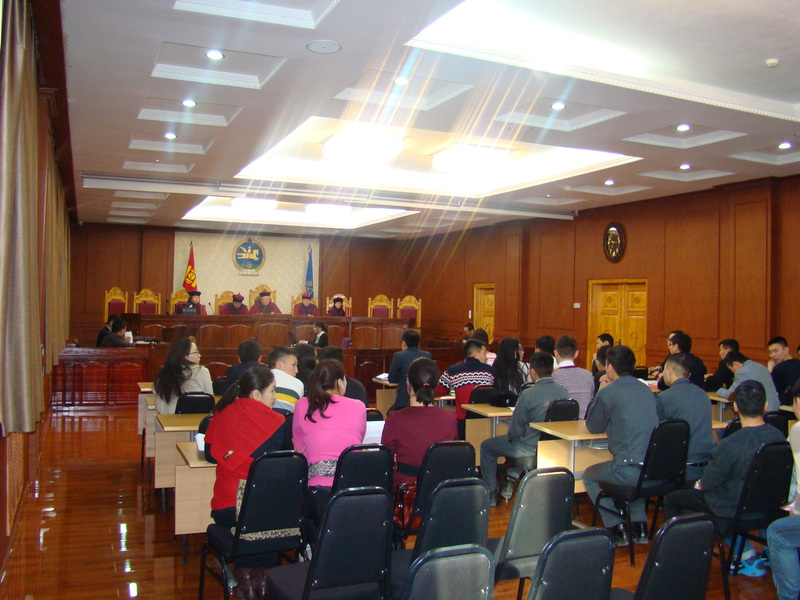 And the fact that warnings such as “if you include your provision in this law, I will appeal to the Constitutional Court” are heard in the palace of the State Great Khural more and more frequently is also related with the preventive feature of the judicial system. The Constitutional Court of Mongolia issues its decisions on the basis of the core ideas of the Constitution and within the principles set forth in the Constitution.It does not make decisions led by its conclusions of whether a certain law, regulation or decision is “right or wrong” or “good or bad”. As for some disputes, it is not negated that some regulations contained many advantageous points. However, the Constitutional Court does not judge from that angle but makes decisions from the standpoint of the core principles reflected in the Constitution of Mongolia.This also demonstrates that even the Constitutional Court has its own limits and boundaries. It’s not an easy task to defend the basic rights of the citizens and safeguard the constitutional system in the current open market society of Mongolia where many different interests of people coexist. Despite the acceptance and cultivation of the concept of legal state, there are still incidents of distorted interpretation of the content of the Constitution by authorities to mend it to their selfish interests and to utilize provisions of the Constitution deliberately for their own purposes. Thus, the duty of interception of such violations and defence of the constitutional system rests with the Constitutional Court. Guaranteed fulfilment of the rights and freedoms of the citizens supports practical realization of the principles of democracy and equality and created conditions for strong solidarity of the state and the people.The Constitutional Court of Mongolia as an institution tasked to provide the highest control of observance of the Constitution has been defending the rights and freedoms of the citizens of Mongolia and seizing breaches of those principles. Strengthening legal state and cultivation of rule of law will be the main guarantees of human rights and freedoms while a correct, balanced distribution of state power between the legislative, executive and judicial branches provides conditions for implementation of such a guarantee.It could be said that court autonomy and judges’ independencewere derived from the concept of division of power.The independent status of the Constitutional Court and its members is a warrant of functioning of the constitutional judicial authority and a prerequisite for protection of the rights, freedoms and interests of the citizens and assurance of balance of powers. The principle of independence of the judicial authority embraces in itself a complex and multifaceted concept and its independence is fully realized only when all its safeguards are ensured. Although the Constitution of Mongolia and the Law on the Constitutional Court of Mongolia have legally approved the independent status of the Constitutional Court, the actual relations between the legislature and the Constitutional Court is closely connected with the degree of independence of the Constitutional Court. Just as an example, the amendments to the Law on the Constitutional Court approved by the State Great Khural on 19 January 2016 included provisions which degraded the legal status of the members of Constitutional Court and encroached on their independent status. Following citizens’ petitions and complaints on these amendments, the Constitutional Court examined and rejected them in June 2016. Issuance of this decision met quite a resistance and pressure of the authorities and legislators and, perhaps, many of you remember that event. Nevertheless, the Constitutional Court was able to issue this resolution for the sake of safeguarding the Constitution. Challenges similar to this exist, but the Constitutional Court of Mongolia has been consistently working with dignity to fulfil its functions of ensuring observance of the Constitution and protect human rights. The process of inspection and resolutions of disputes at the Constitutional Court of Mongolia is governed by the Constitution of Mongolia, Law on the Constitutional Court of Mongolia, Law on the Procedure of Examining and Resolving Disputes at the Constitutional Court and other legal acts issued in connection with them. Many issues are waiting for their solution in the area of improvement of the constitutional control and enhancement of the constitutional judicial power for assurance of the constitutional principles, warranted protection and promotion of human rights. Development of constitutionalism and rule of law, alleviation of pressures presented by political parties and officials and ensuring independence of the Constitutional Court are the foremost priorities at present. For this purpose, the Constitutional Court of Mongolia faces needs to improve the Law on the Constitutional Court of Mongolia and Law on Examining and Resolving Disputes at the Constitutional Court to match the international level as our short term objective. In these endeavours, the Constitutional Court has been aiming at providing regulations that enhance citizens’ participation as it plays an important part in the implementation of the constitutional control and serves as its main leverage and at making it easily understood by the citizens how they can seek protection of their rights and freedoms. Also the Law on the Procedure of Examining and Resolving Disputes at the Constitutional Court of Mongolia does not provide detailed and exact regulations of implementation of the decisions of the Constitutional Court. This also reveals presence of some backwardness in the legal regulation in Mongolia as compared with the other countries. In addition,it should be highlighted that Constitutional Court of Mongolia gives high importance to cooperation of the institutions of the constitutional judicial branch in the issues of defining the further tendencies and future orientation as well as enhancement of the quality and impact of the resolutions of the Constitutional Court. 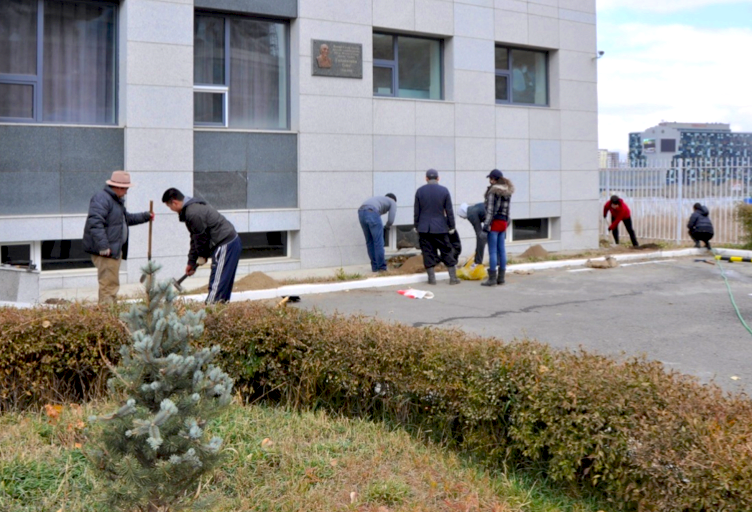 Furthermore, it can be said that assurance of all possibilities for independent operations of the Constitutional Court of Mongolia free from political and economic pressure and provision of normal working conditions are a critical part of this process. Therefore, the master direction of the Constitutional Court of Mongolia is to further enhance the independence of the Constitutional Court and freedom of its members from external influences. From an international angle of view, the further directions of constitutional judicial power are in further expansion of the scopes of objects and subjects of constitutional control, strengthening the constitutional system and promotion of stronger guarantees for implementation of human rights and freedoms. The above discussions in this presentation have, perhaps, proved that the Constitutional Court of Mongolia has been walking shoulder to shoulder in achieving universal recognition and reinforcement of these global values as can be seen from the path of development of the constitutional judicial system in Mongolia. Finally, the Constitutional judicial power has gained its ground in the democratic society. This is a bright evidence that the Constitutional Court of Mongolia has been skillfully fulfilling its functions proving to be the main safeguard and guarantee of the democratic values, constitutional system and protection of human rights and freedoms.Thus, we are fully determined to responsibly uphold to these high values and approve the trust in us and to further dedicate our honest and dignified decisions for the noble deed of protection of the Constitution.